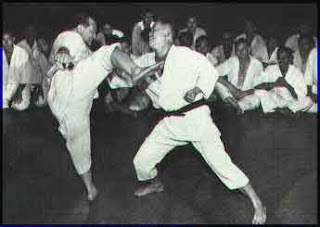 When a new student begins to train in Karate, he or she learns basic stances, punches, kicks, defensive moves and so on, which are organized into pre-arranged ancient forms called kata. Kata, by its nature, works from a script. A real fight, however, is utter chaos. Being able to deal with a chaotic situation means having to cultivate various states of mind to ensure success against some maniac that you happen to run up against. Zanshin is a heightened sense of awareness of one's surroundings. Mushin means open mind - a mind that has no pre-conceptions or expectations. Kan-Ken futatsu no Koto - the ability to see with "intuitive" eyes via the unconscious. Psychical seeing enables one to sense the presence of danger. Fudoshin - a principle developed by the great swordsman Miyamoto Musashi, refers to a relaxed, calm disposition. The detached, ego-less mind should be regarded as the ultimate ideal for the warrior.